Zoobic Safari photos, for those who cannot make it. Zoobic Safari Photos just in case you cannot handle the excitement. These are just a few Zoobic Safari photos that I have put together, they should give you a bit of an idea of what to expect. Don't forget nothing beats actually being there and seeing it live. I was lucky, because I was there mid-week and it was very quiet, hardly anyone at all so the guides had time to really explain what was happening here now and in the future. 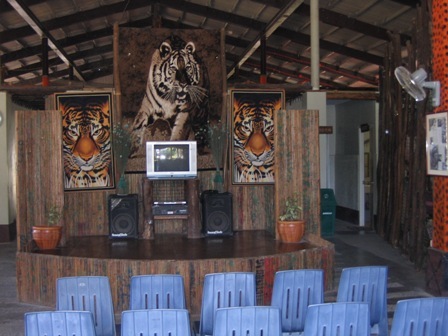 The Zoobic Safari is worth seeing, it takes no more than 2 hours to do the whole show, be warned though if you are a bit squeamish the live chicken and tiger show may not be to your liking, have a look here for more information on Zoobic Safari. As you first arrive, the Zoobic Safari looks like a huge shed, you walk in pay the cashier, (have a look here for a photo of the cashier) then you go past the obligatory shop full of Zoobic souvenirs. Just past here is a video orientation area. It is here that you start your safari. 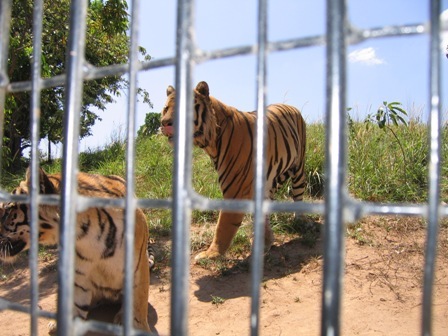 A guide will talk you through a video of the tigers and why Zoobic Safari was put together. This photo was taken inside the Zoobic Petting Zoo. 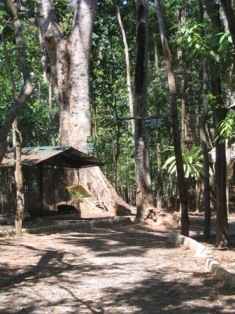 The path meanders through the jungle with various animals in cages or enclosures along the way. Not sure why they call it a petting zoo, you cannot touch any of the animals, some of them you definitely do not want to touch! 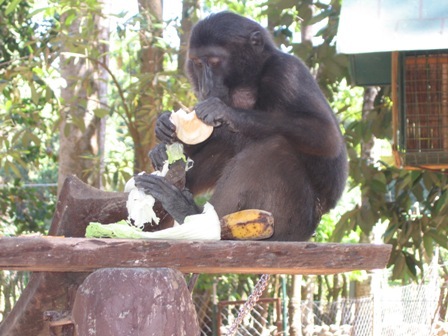 This monkey was quite happy munching away on some fruit. You can just make out at the back of the photo a small cage with a roof on it, this was his home during the night. He was on a chain which allowed him to move from the cage across a pole to the sitting platform he is on at the moment. I put this photo in mainly to highlight the bars you are behind in the jeepney that takes you into the Zoobic Tiger Safari. It also shows the size of the tigers and the interest they have in the chicken that is being dangled in front of them. The Zoobic tigers will go to grab them, but the guide will either pull the chicken out of the way or the jeepney driver will start to drive off dragging the chicken behind so the tigers chase and pounce! These are the pens that hold the tigers. 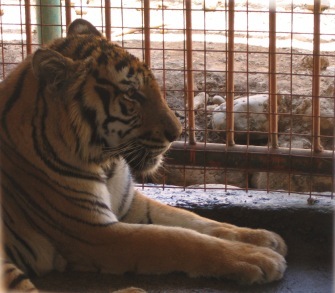 The Zoobic tigers are rotated on and off the habitat, when they are not entertaining the guests they can have a peaceful time in these cages or pens. The guide takes you through the pens, which are just behind the roaming area. You have to admit tigers are a majestical looking animal. 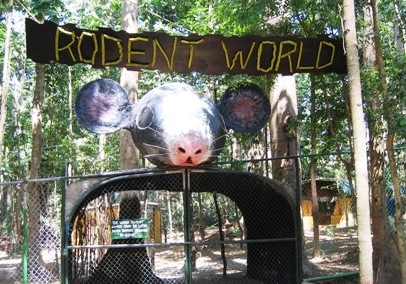 The Zoobic Rodent World is a future enterprise, which you can only guess at. I will have to revisit once it is up and running. Have a look here for more information on Subic Bay and other attractions in Subic Bay.